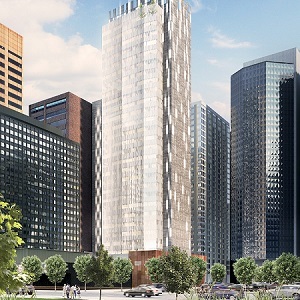 PBA Land and Development Thursday will unveil plans to build a major new luxury hotel in downtown Calgary. The Dorian will be the first new luxury hotel in the city in 20 years and will actually be two hotels in one, both carrying the Marriott brands. The dual-tower development will house a Courtyard by Marriott hotel and an exclusive Marriott Autograph Collection hotel. The development at 525 5th Avenue S.W., will be 27 storeys. It will contain 120 rooms in the Autograph Collection hotel and 180 rooms in the Courtyard. Andrew Boblin, PBA’s senior vice-president of real estate and development, told RENX construction of the hotel will take about 27 months. It is scheduled to open in the fall of 2020. “We will build and own the hotel but we have franchise agreements with the Marriott,” said Boblin, who held senior development roles at GWL Realty Advisors and Tonko Realty Advisors before moving over to PBA. The Courtyard brand is positioned at the mid to upper level of the hotel market, appealing to travellers who are price-conscious but want something more than a budget hotel will provide. Boblin said the lower floors of the hotel will house the Courtyard, with the upper portion of the tower housing the Autograph brand. “Catering to sophisticated modern travelers, The Dorian will integrate the best local suppliers – from food and beverage to soap and linens – into its business model, while simultaneously enhancing arts development by procuring and curating local art and promoting local artists. The Dorian will combine Calgary-modern with British flair inspired by the wit and style of playwright Oscar Wilde. PBA also has a mixed-use development site in the Beltline along 17th Avenue and 1st Street S.W. that’s currently on hold. “It’s obviously market-dependent but a combination of office, retail and residential. That’s market-driven but we’re positioning it as the market recovers we’ll be ready to start construction on that,” said Boblin. The company’s website describes the proposed mixed-use development as having four storeys of commercial space (26,250 square feet of retail) and (83,500 square feet of office) and 23 storeys of residential with nine live-work units and 148 apartment units. Boblin said PBA is also doing some “significant facelifts” on a couple of its existing assets in south central Calgary just to re-freshen them. Those are a combination of flex industrial and second-storey office buildings. PBA is also development manager for a 545-acre parcel of land in Cochrane – a master-planned community just west of Calgary it is managing for the Phillips family. PBA was founded in 1965 by entrepreneur Joe Phillips, who was also involved in the oil and gas industry, after he moved to Calgary from West Virginia. “We received approval for our neighbourhood plan last year. That essentially sets what type of homes we can put on it,” Boblin said. “So there’s an entire mix of various types of homes between multi-family, duplex, laned products all the way up to estate as well as approximately 45 acres of commercial lands as well as some commercial lands for a town centre. The next step will be subdivision and servicing of the land before the lots come onto the market. Boblin said about 2,800 homes are planned for the community along with a multitude of retail, office and light industrial buildings. “Things like a grocery store. We’re looking at potentially a hotel on the site. And it’s approximately a 15-to-20-year build-out on that land,” he added. The market will dictate how much commercial space will be built, but it’s estimated it could be as much as 700,000 square feet. PBA develops and manages a diverse portfolio of office, retail and industrial properties as well as undeveloped land in and around Calgary. Today, its assets are primarily office and industrial and are concentrated in downtown Calgary and the south central part of the city, Boblin said. Buildings and properties in the PBA portfolio currently amount to about 500,000 square feet. “We’re obviously in a tenant’s market right now, but we are seeing signs of recovery and we take a long-term view on our assets and on developments. And we’re still quite bullish on Calgary,” Boblin said. “Because we take a long-term view, we don’t really focus so much on what Calgary was like, let’s say in the boom and bust cycle . . . I think what we’ve come to establish is that now it’s probably the new normal for Calgary. On a personal level Boblin, who has more than 25 years of experience in real estate development, worked for several other companies before joining PBA. He served as manager of construction and development at Calgary Co-op, was an institutional partner and development manager for GWL, and most recently was director of development and construction at Tonko. During his career, Boblin has been involved in over $1 billion worth of real estate development projects. He holds an Honours Diploma in Architectural Technology from the Northern Alberta Institute of Technology and is LEED certified.